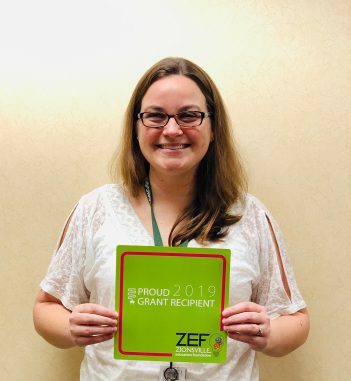 The Zionsville Education Foundation presented seven Imagine Professional Development Grants to nine Zionsville teachers last month. The grants totaled more than $15,000. The grants facilitate professional growth and revitalization for experienced educators by funding conference attendance. Individual, corporate and small business donations and profits from ZEF’s annual Barn Bash event fund Imagine Grants. “With the school system being the lowest-funded per pupil in the state, (ZEF) realized budgets are tight, and with that comes tight budgets for professional development opportunities, so we saw that there was a need there and are trying to fill that as best we can,” said Lyle Browne, ZEF executive director. Interested teachers complete an online application listing the learning experience they wish to attend, which is later reviewed by a grants committee. The grants benefit a variety of disciplines. The conferences began this month and continue until February 2020. “We hope that it strengthens classrooms by expanding the knowledge teachers have, and therefore expanding what they’re teaching to our kids,” Browne said.